Holiday accommodation in Aljezur in the Western Algarve. Cheap. The village Aljezur is in the centre with about 2.739 habitants (censos 2001). Aljezur/ Igreja Nova: The village Aljezur of is divided into Aljezur and Igreja Nova, Igreja Nova is the newer part. There are various super- and mini-markets, 1 market place, 1 post-office, 1 free internet facility, 3 banks, 3 ATM's and plenty other shops, restaurants, pubs, cafés and 1 petrol station. Approximate distance to the beaches Arrifana, M.Clérigo and Amoreira is 8 km. 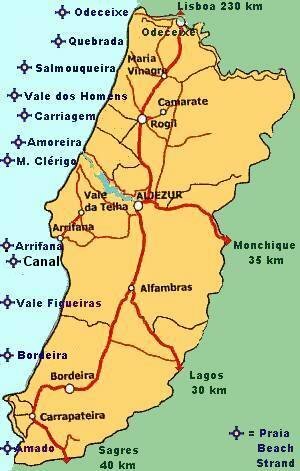 In following links you can find objects of intrest and a map of Aljezur. Holiday apartments, holiday houses and villas so as room rental in different price classes in Aljezur will be soon presented.